Archie Bunker, was a working-class family man who held bigoted, conservative views of the world. His viewpoints clash with nearly everyone he comes into contact with especially his liberal son-in-law Mike Stivic (or, as Archie delights in calling him, "Meathead"). Gloria Bunker Stivic the Bunkers' college-age daughter was married to Michael Stivic. Gloria frequently attempted to mediate Archie and Michael's arguments. 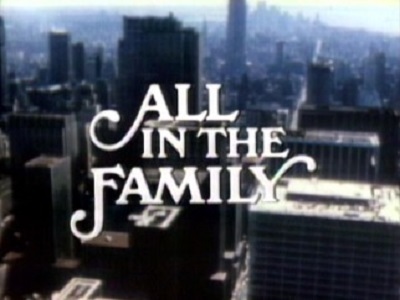 The roles of the Bunkers' daughter and son-in-law (then named "Dickie") initially went to Candice Azzara and Chip Oliver. However, after seeing the show's pilot, ABC, the original production company, requested a second pilot expressing dissatisfaction with both actors. Lear later recast the roles of "Gloria" and "Dickie" with Struthers and Reiner. Penny Marshall, (Reiner's wife, whom he married shortly after the program began in April 1971), was also considered for the role of Gloria. During the earlier seasons of the show, Struthers was known to be discontented with how static her part was, frequently coming off as irritating and having only a few token lines. As the series continued Gloria's character became more developed, satisfying Struthers. Struthers appeared in 157 of the 202 episodes during the first eight seasons—from January 12, 1971 to March 19, 1978.